There are many hotels in Seville but it is convenient to book the rooms in time. For your convenience we have selected a set of hotels of different categories and prices so you can choice the most suitable for your requirements. We have special rates for these hotels and you may reserve your rooms using the Hotel Reservation Form available here (PDF). Please, notice that the request for hotel acommodation and payment should be received before the 30th August 2002. Apartament building located in a commercial district. 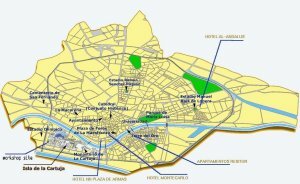 Close to downtown and the popular Triana neighbourhood. Note: The conference organization will provide a shuttle bus service between these hotels and the conference site.